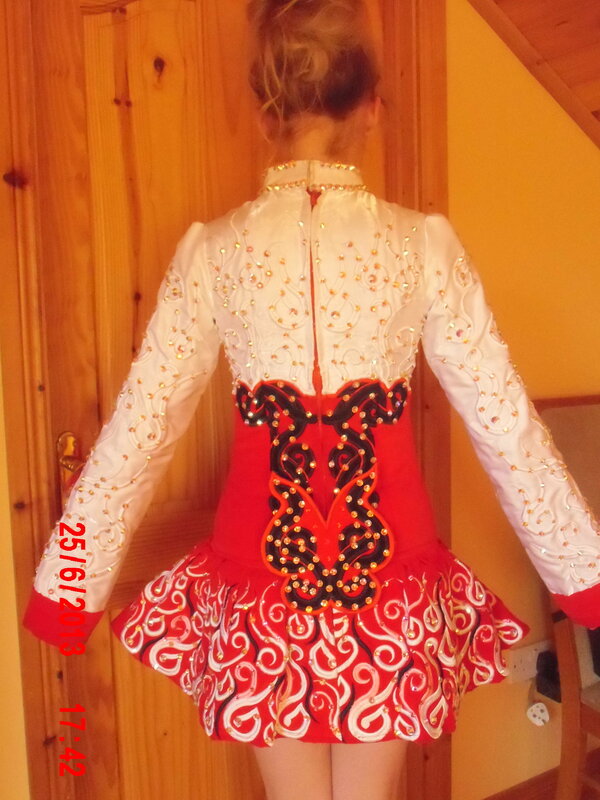 Elegant & beautiful Championship level Geraldine Taylor dress made in September 2012. Slim fitting latest style – would suit approx 14 – 16 year old. Absolutely stunning on stage with over 2000 Swarovski crystals. White twinkle satin at top of dress stretches down to just under bust area changing to red velvet for remainder of bodice & skirt. There is amazing detail on both the white and red fabric. The white fabric has celtic design in white stitching covered with AB crystals. 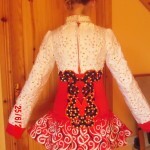 The red fabric has celtic design in baby pink, white & a little black stitching covered with AB, pink & red crystals. Soft skirt lined with white netting and red underneath. Shawl is a small round shape in red velvet. Dress in excellent condition. Matching bloomers & headband included. Selling due to growth spurt. Asking Price: £800 – Willing to negotiate on price. Shipping costs are not included in the asking price. Sale is final.